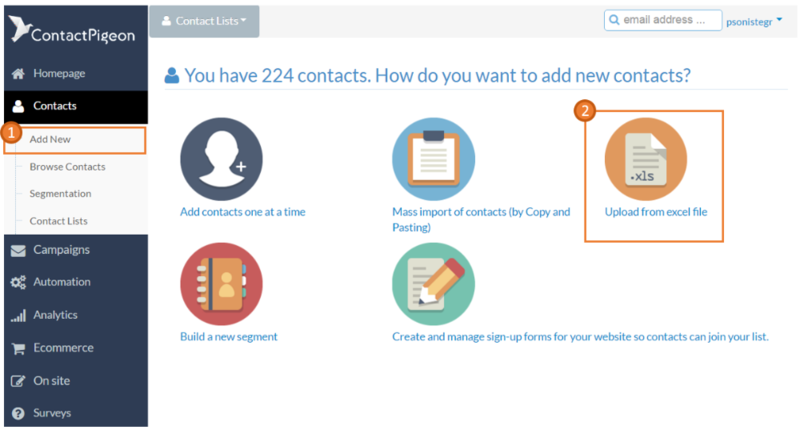 There are 2 ways to add or update contacts in bulk. You can add contact emails directly via text inputs, or upload directly from an MS Excel file (.xls or .csv). This article takes you through the step by step process of adding and updating contacts in bulk. This is a quick way to make bulk addition of emails to one or more contact lists. Step 1. From the left side menu options, select Contacts > Add New. Click on "Mass import of contacts (by Copying & Pasting)". Step 2. Select one or more lists in which the contacts will be added to. Enter the text that contains the emails, separating each with space or comma. Step 3. When you are done with all the emails, click " + Import Contacts" to save. Step 4. On the next page, you will see the statistical outcome of this transaction including total emails entered, number of contacts that are new, and those that are already in your existing lists. Click " Repeat >" if you'd like to add more contacts using the same process, or simply exit to complete the addition. Before you start, you will need to prepare your spreadsheet file of contacts and save it as an .xls or .csv file. Please refer to a sample template attached here and replace with your own data: Excel Upload Template. Note that the first 3 rows of the contacts must be filled out. Step 1. From the left side menu options, select Contacts > Add New. Click on "Upload from Excel File"
Step 2. Select one or more lists in which the contacts will be added to. Then choose the excel file (*.xls or *.csv) that contains the email addresses and relevant contact details. Please note: First 3 rows of the Excel file (*.xls) cannot be left blank and the 1st column should be email. Step 3: Click " Import Contacts" to continue. On the next page, choose how each excel column will be mapped to a contact filed in ContactPigeon. If you would like to skip a column from excel, keep the Mapped Into Field in the default "Do not Import This Field" selection. Step 4: When you are done, click " Save". On the next page, you will see the statistical outcome of this transaction including total emails entered, number of contacts that are newly added, and those that already exist in your list. Click " Repeat >" if you'd like to add more contacts using the same process, or simply exit to complete upload.